Does anybody have the two book The Queen's Indian Defence & The Nimzo-Indian Defence both by Michael Roiz in pgn format? Would be amazing! Thanks to gambit_man, the original uploader! Just asking: Did Roiz write a book on the Queen's Indian as well? Would anybody be able to share it? Cheers! Tommy_H wrote: Indeed, many thanks! This book provides a companion volume to the author’s highly-regarded book on the Nimzo-Indian Defence. The starting point of the QID is 1.d4 Nf6 2.c4 e6 3.Nf3 b6, but Roiz also covers 3.g3, the Catalan, to complete his repertoire. How can I use the password to download the book? After clicking download button, the page gives me an error message (error timed out). This isn't happened with files whitout password. Any help? pereyrafg wrote: How can I use the password to download the book? After clicking download button, the page gives me an error message (error timed out). This isn't happened with files whitout password. Any help? Now that the book is out would someone be kind enough to post a pdf of it ? I saw it on some russian sites but I don't really understand how it works... Many thanks ! 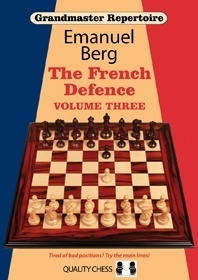 The French Defence: Volume Three by Emanuel Berg is the concluding volume of a trilogy by the Swedish Grandmaster. The first two books in the series covered 1.e4 e6 2.d4 d5 3.Nc3 Bb4 while this covers everything else White can try against the French. The bulk of the book (over 250 pages) is devoted to White’s second most popular way of meeting the French, namely the Tarrasch variation (3.Nd2). This allows Black a wide variety of answers but most are considered either slightly dubious (3…Nc6) or allowing White a slight but persistent advantage (think 3…a6, 3…h6, 3…Be7 or 3…c5 4.exd5 exd5). It may well be that 3…Nf6, Berg’s choice, also falls into this category but there is no question that it is a much more fighting approach than the theoretical equalizer 3…c5 4.exd5 Qxd5 which is holding up well at the very top levels. White has two main tries after 3.Nd2 Nf6 4.e5 Nfd7 which lead to quite different play. Those who prefer a big center with the advantages and responsibilities it entails choose 5.f4 which Berg advocates meeting with 5…c5 6.c3 Nc6 7.Ndf3 Qb6 8.g3 cxd4 9.cxd4 Be7. White needs to be careful here as he is significantly behind in development and inaccurate play can result in Black opening the position to his advantage, often by sacrificing a knight on e5. The critical line here is the wild continuation 10.Bh3 0-0 11.Ne2 f6! 12.Rf1! Kh8! 13.Nc3!? fxe5 14. fxe5 Rxf3! 15.Qxf3 Nxd4! 16.Qe2! g5! 17.Kd1 Qb4! 18.Be3 Nc6 19.Bxe6 Ndxe5 20.Bxd5 Qd6!. The latter move is a novelty of Berg’s and one he believes to offer equal chances for Black which he supports with two pages of analysis. Play is considerably calmer after 5.Bd3. Against the gambit line 1.e4 e6 2.d4 d5 3.Nd2 Nf6 4.e5 Nfd7 5.Bd3 c5 6.c3 Nc6 7.Ngf3 he likes 7…g6 while against the traditional main line 7.Ne2 his choice is 7…cxd4 8.cxd4 f6 9.exf6 Nxf6 10.0-0 Bd6 11.0-0 Qc7. Berg spends roughly 90 pages on this variation and Black seems to be holding up well but one line where care should be exercised is the variation 12.Nc3 a6 13.Bd2 0-0 14.h3 Bd7 15.Re1 Rae8 16.Rc1 Qb8 and now instead of the decentralizing 17.Na4 (covered in the book) the Norwegian Grandmaster Jon Ludwig Hammer was successful with 17.a3 against Berg in a game played in the spring of 2015 (i.e. after the publication of this book). Black responded 17…Re7 but after 18.b4 b5 19.Be3 Be8 20.Ne2 White had suppressed Black’s counterplay and had an annoying small advantage. Berg devotes 115 pages to the Advance French consistently advocating approaches with …Nh6 (1.e4 e6 2.d4 d5 3.e5 c5 4.c3 Nc6 5.Nf3 Qb6 6.a3 Nh6 and 6.Be2 Nh6) not fearing Bxh6 by White. Against the Milner-Barry Gambit (6.Bd3), which has always been popular at the club level, he favors 6…Bd7 7.0-0 cxd4 8.cxd4 Nxd4 9.Nxd4 Qxd4 10.Nc3 a6! He concludes Black is doing well in the main line after 11.Qe2 Ne7 12.Kh1 Nc6 13.f4 Nb4! 14.Rd1 Bc5! 15. Bxa6 Qf2. The chapter on the French could be important for a wider audience as those who meet the Alapin (2.c3) Sicilian need to know how to answer 1.e4 c5 2.c3 e6 3.d4 d5 4.e5. The remainder of The French Defense: Volume 3 covers a wide range of lines. The Exchange Variation is not likely to strike fear in Black’s heart but those who play the French need to be familiar with a way to meet it, particularly at the club level. Berg’s recommendation is an aggressive set-up with …Bd6,…Nc6, …Nge7, …Bg4, …Qd7 and castling long. Against the King’s Indian Attack he likes 1.e4 e6 2.d3 d5 3. Nd2 c5 4.Ngf3 Nc6 5.g3 Bd6 6.Bg2 Nge7 7.0-0 0-0 which is well-designed to take the sting out of White’s attempts to play e4-e5. The author considers the odd-ball continuation 2.f4, played by both Nakamura and Jobava, to not be too impressive but also not bad. He favors 2…d5 3.e5 c5 4.Nf3 Nc6 5.c3 Nh6! and considers Black’s position to be satisfactory. Berg meets the Two Knights Variation (1.e4 e6 2.Nf3 d5 3.Nc3) not with the traditional 3…Nf6 but instead 3…d4 4.Ne2 c5 meeting 5.c3 with 5…Nf6! 6.cxd4 cxd4 7.Nexd4 Nxe4 8.Nxe6 Bxe6 9.Qa4+ Nc6 10.Qxe4 Qd5! When Black has wonderful play for the pawn. Anyone who plays the Tarrasch variation against the French or meets it with 3…Nf6 will definitely want to have this book. Other who meet 1.e4 with 1…e6, but who play other lines against the Tarrasch, will find the coverage of the Advance variation and second move alternatives quite useful. Much Thanks Everyone for Sharing! Does anyone have the knowledge of the book The Indian Defense of the Queen - Roiz?